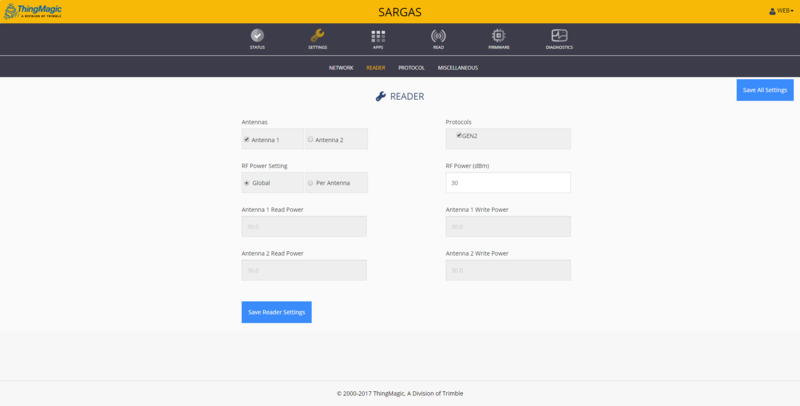 This article provides a step-by-step process for setting up the Sargas 2-port reader from ThingMagic. To begin setup for the Sargas reader, connect an approved antenna to one of the antenna ports. Then, connect the reader to power and wait for it to boot up. Connect the Sargas to your computer using the ethernet cable. Once the reader has completed the boot up process, navigate a web browser to the reader's Web UI, which is hosted at http://sargas-xxxxxx.local, where "xxxxxx" is the last 6 hex characters of the Sargas' MAC address. A label with the full hostname should be adhered to the Sargas device, as shown in the image below. 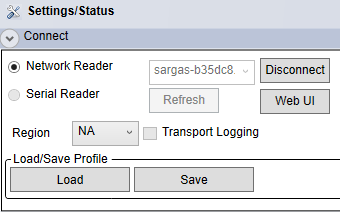 If the reader is connected correctly, the Sargas Web UI page should prompt for a username ("web") and password ("radio") to login. Once logged in, you should see the Status page of the reader. If the web page is not accessible, check the proxy settings on your computer and ensure that they are disabled. The Status page of the Web UI shows important information about your reader including the reader's serial number, firmware version, and even its internal temperature. The reader's serial number is important to note because it is required in order for additional licenses to be granted for the reader, such as RAINstream. Alternatively, the reader can be accessed using the Universal Reader Assistant (URA) tool from ThingMagic. 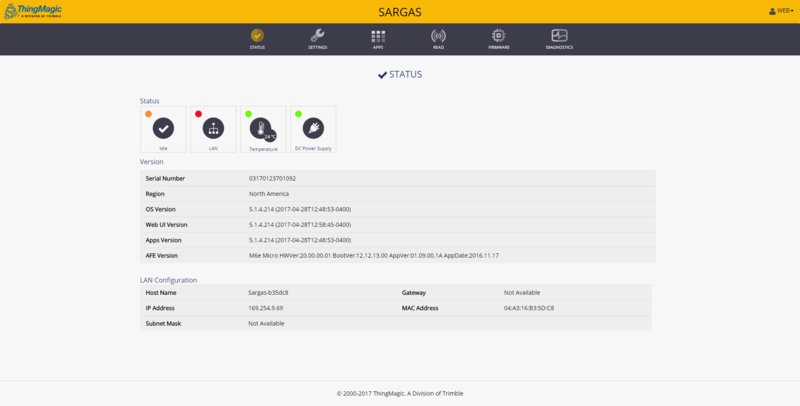 To connect to the Sargas reader this way, you will need to launch URA and select the "Connect" button. Under the "Connect" settings, select the Network Reader radio button and type the reader's hostname (without "http://") into the text box. Once this is done, select "Connect". Once the reader is connected, the Web UI can be launched directly from URA by selecting the "Web UI" button. Once the reader has successfully been connected and the Web UI is shown, the reader's settings can be configured to read UHF RFID tags. The Settings tab in the Web UI allows the user to customize many settings for the reader, from network configuration to antenna power. In order to begin reading tags, you will need to set an antenna port to be active. This can be done in the Reader tab. After changes have been made to the reader's Settings, you will need to save the changes. This can be done by selecting the "Save" button at the bottom left of the screen, or the "Save All Settings" at the top right of the screen. You should get a notification stating that the settings were saved successfully. 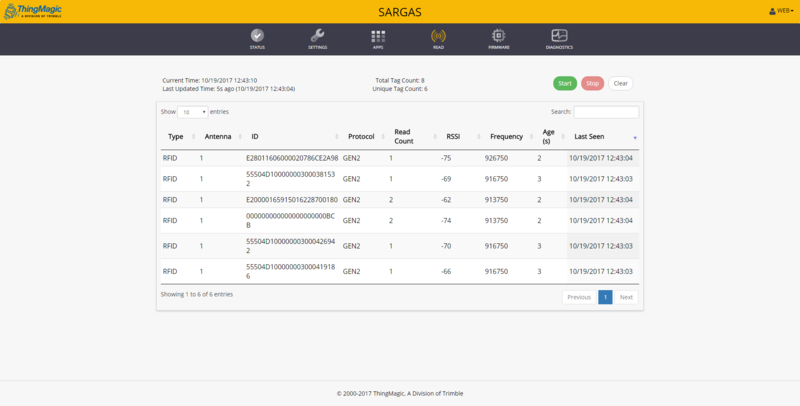 Reading tags with the Sargas reader can be done either through the Web UI or via URA. Once the reader is connected to URA, reading tags is as simple as selecting the "Read" button and introducing tags into the reader's read zone. Reading tags via the Web UI is just as simple. First, ensure that the correct antenna port is enabled in the Settings > Reader tab, and then navigate to the Read tab in the Web UI and press the "Read" button. If tags are in the read zone, their EPCs should populate the page. That concludes this article on setting up the Sargas reader. If you have any questions, please don't hesitate to send an email to support@atlasrfidstore.com.